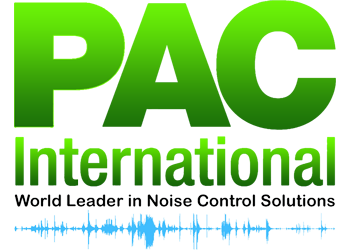 Home > PAC International, Inc.
PAC International, LLC., is the world leader in Noise Control Solutions. PAC International offers an extensive line of noise control, and vibration isolation products. PAC International strives to be an environmentally friendly and socially responsible company by manufacturing the RSIC© products in the United States with recycled materials. PAC International has also developed a proprietary rubber cleaning process to remove VOC's from the RSIC isolators making the RSIC© products odorless when compared to other rubber isolation products. The RSIC-1© wall and ceiling clip, RSIC-V© value line wall and ceiling clip, and RSIC-U© head of wall clips are approved for use in over 140 different UL Fire Resistive designs combined. The RSIC-DC04 clip isolates mechanical vibration, or be used to decouple a framed wall or ceiling. The RSIC-SI (Spring Isolator) clips control low frequency system. These are just a small example of the applications possible with the RSIC line of isolation clips. PAC International's combination of UL testing, Acoustical Testing, Proprietary VOC cleaning process, Recycled content, and US manufacturing make the RSIC line of Noise Control Products the correct choice for any project.